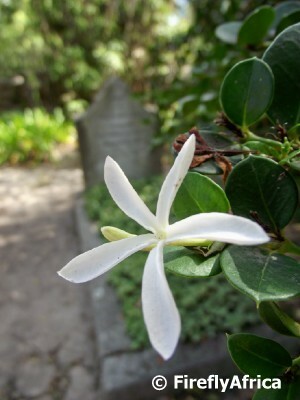 The flower in the picture is that of the Num-num tree and it was taken in Knysna at George Rex's grave which can be seen in the background. The Num-Num Tree is indigenous to South Africa and grows wild along the KwaZulu-Natal and Eastern Cape coastlines occurring on sand dunes and at the margins of coastal forests. Am evergreen shrub or small tree, it gets planted in garden as ornamental trees, are easy to grow and very hardy. Pretty flower with an unusual name. Wonder if it's good to eat.